My Yankee Clipper Contest Club SO2R+ AUX pin-outs are as follows. 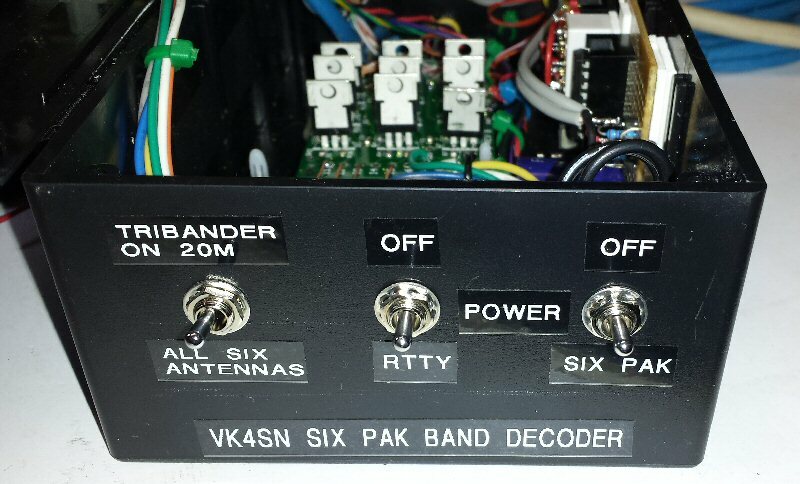 Remember that the Band Data BCD outputs are set by the logger under antenna set up. One must set up N1MM logger like this so the correct BCD appears on the YCCC SO2R+ AUX connector. 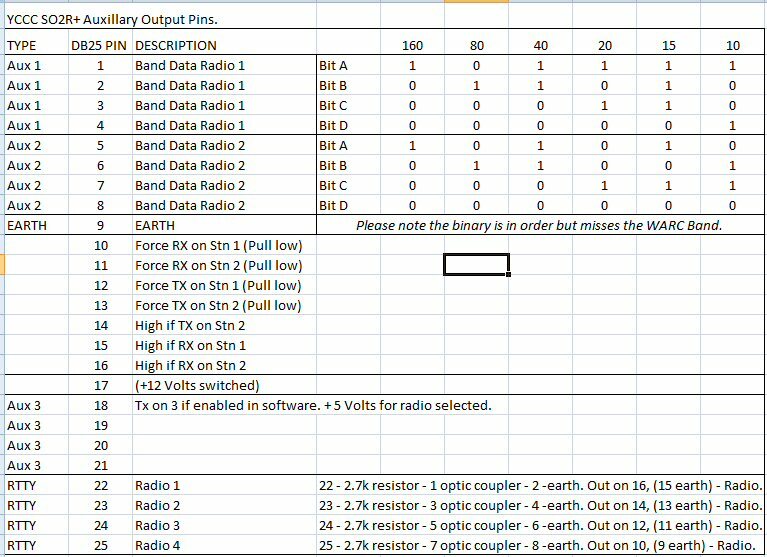 Aux Pins 1 to 4 and 5 to 8 are for BCD Band Data from rigs A and B respectively to switch the SixPak antennas. Pin 14 is 5 volts when rig 2 in transmit - this turns on a relay to make the RTTY transmit on rig 2. I have incorporated a switch to allow 10 and 15 meter bands switch in the 20m antenna as it is a Tribander. The switch will allow full use of 160 thru 10m antennas when in manual mode via switch boxes. Adding 2 x db9 connectors on the rear of the box allows the switch boxes to sit in parallel with the automated system. Unified Microsystems BCD10 and relay switching transistors HSD9. 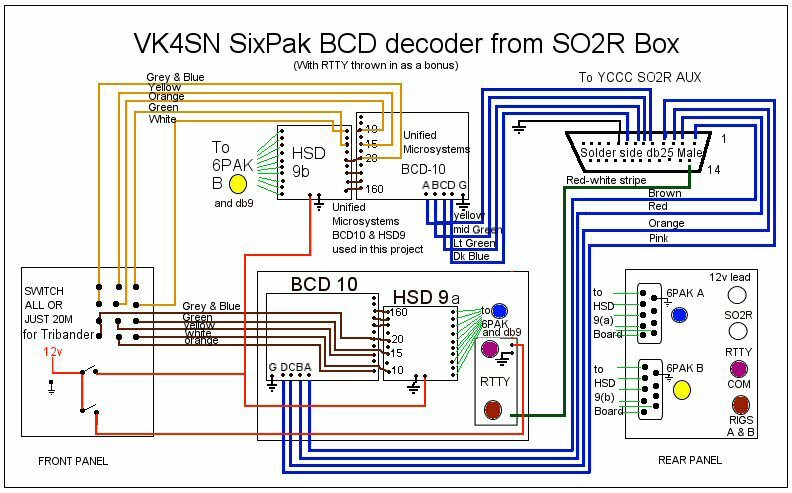 This will automate the system by converting the BCD output from the YCCC SO2R box and switch in the appropriate antenna. The big red switch has been replaced with 2 switches to allow independant switching from either rig when switching from a tribander plugged in on 20m to all six antenna positions on the SixPak. 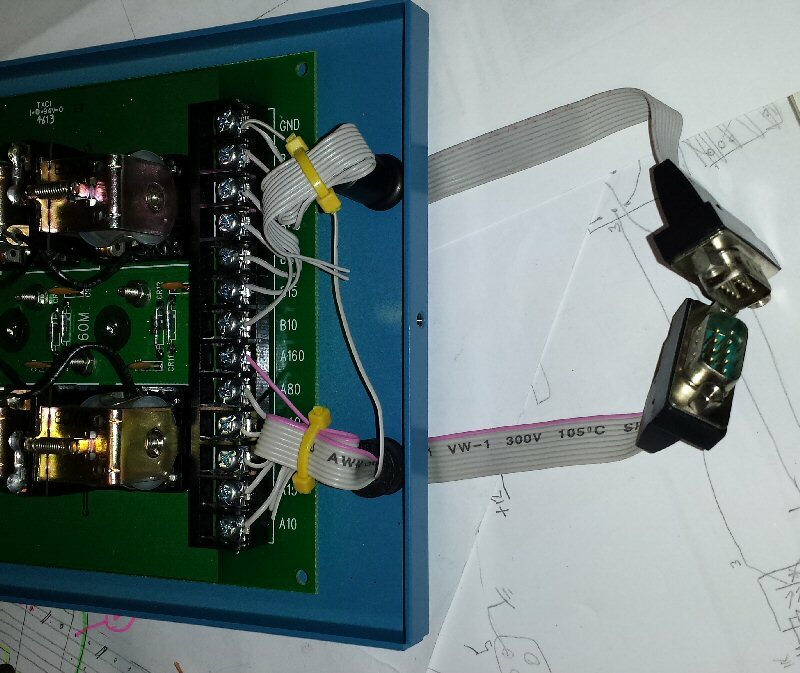 SixPak Controller box wired up for manual use. Before attempting to use the SO2R Box with N1MM Logger, you should verify that it is working correctly with the SO2R Box Utility. Set up two virtual port pairs using com0com or n8vbcomm; in my setup, I paired COM 7 with COM 17 and COM 8 with COM 18. See the SO2R Box Manual for more information; it is a little tricky to set these up. 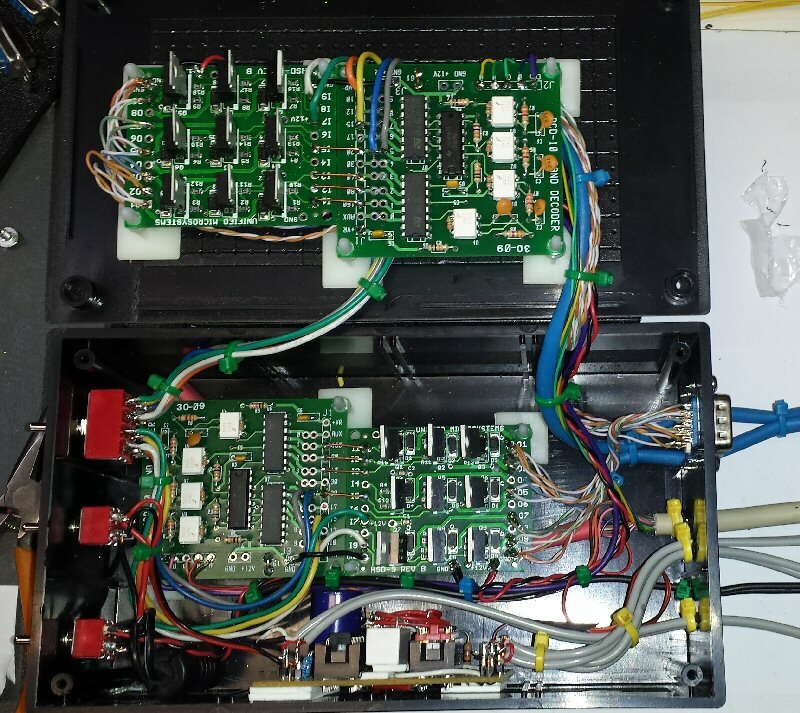 Make note of which COM ports you are going to use for the keyer and SO2R Control. Start the SO2R Box Interface. If you try to start N1MM Logger first, the program will show you the “About N1MM Logger” screen and sit there forever, so you must start this first. 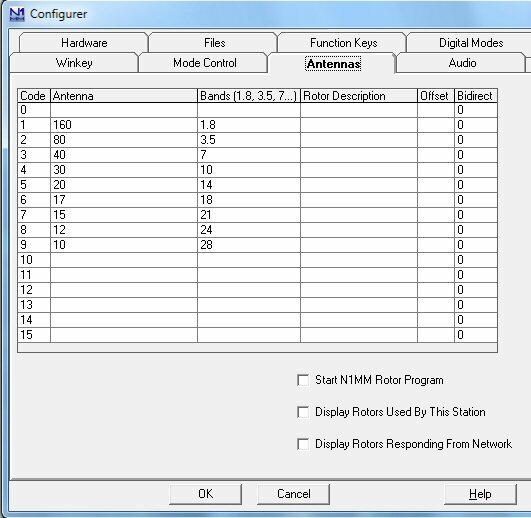 Click the “Logger controls keyer”, click the :”Keyer PTT”, make the Radio Boxes specify Radio 1 and Radio 2, select the correct COM port specified in the drop down box for the Keyer box and check “keyer”; select the Com port for the SO2R and then check “SO2R” In my setup, Keyer is checked and the Com port is COM 17, and SO2R is checked and the Com port is COM 18. Open up the N1MM Logger Config and choose “Configure Ports, Telnet Address, Other”. Select the “Hardware” tab. Configure both radios and check the SO2R tab. Find the port that is currently being used to generate CW. However you were doing it, TURN IT OFF. Find the port or method you are currently using to generate PTT. However you were doing it, TURN IT OFF. If you had a different SO2R Box Controller setup, TURN IT OFF. 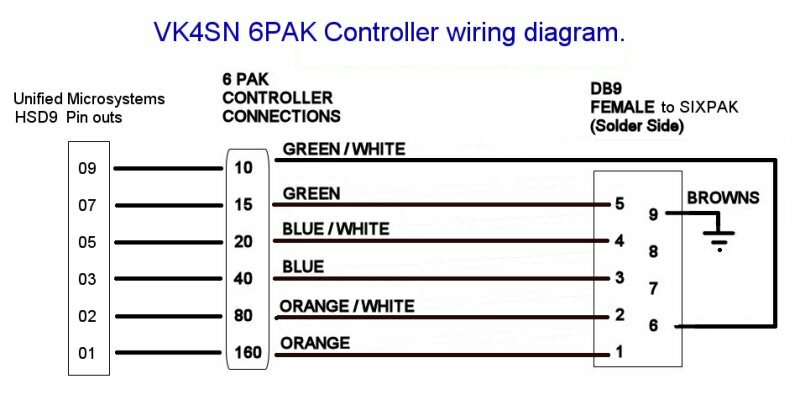 Find the COM port that is in the pair that you setup for the keyer in Step 2 (in my case, COM 7). Click on the “CW/Other” box. Then click on “set” for that COM port and put a check mark for “Winkey”. Make sure the “Radio number” is “BOTH”, and that the “SO2R Box Protocol” is None. DTR, RTS, Foot Switch, and CW/PTT Port Address are all irrelevant. 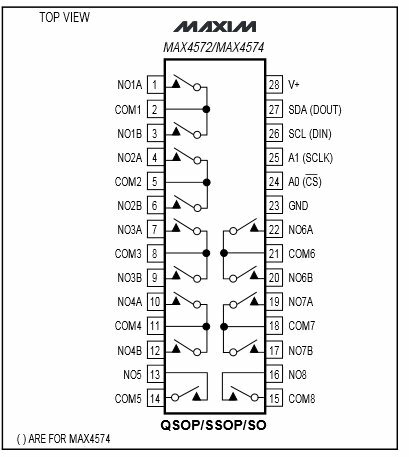 Find the COM port that is in the pair that you have set up for the SO2R Control in Step 2 (in my case, COM 8). Then click on “set”. The “Two Radio Protocol” should be changed to “OTSRP”, the “Radio Number should be “BOTH”, and RTS should be set to PTT. None of the other values are relevant. Click on Okay. The SO2R Box is now configured. Open the 2nd Entry Window (use backslash “\”). Put both Switches on the SO2R Box in the center or “Auto” position. Rotate the Speed Pot on the SO2R Box. The CW speed in the Entry Window with the Tx focus should vary. Press the Pause key. N1MM Rx and Tx focus should change from one Entry Window to the other. The red LEDs on the front of the SO2R Box should change in step with the Pause key. Make sure that “normal” is the audio selection on the SO2R Box Interface. Press the ~ key. The audio in the headphones should change from mono (Rx focus radio in both ears) to stereo (Radio 1 audio left ear, Radio 2 audio right ear). Now select “Latch” on the SO2R Box Interface. Send a message on Radio 1, and the audio in both headphones should be that of Radio 2. Copy of my setup for N1MM Logger. 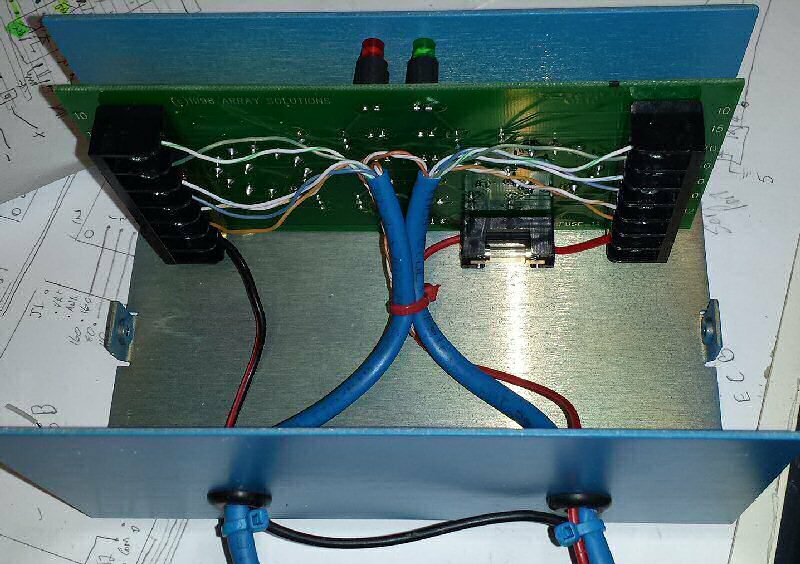 COM1 paired COM11 for WinKey CW via SO2R Box. COM2 paired COM12 for OTRSP and PTT via SO2R Box. COM3 is my 1st Radio, the FT2000. COM4 is my 2nd Radio, the FT2000. 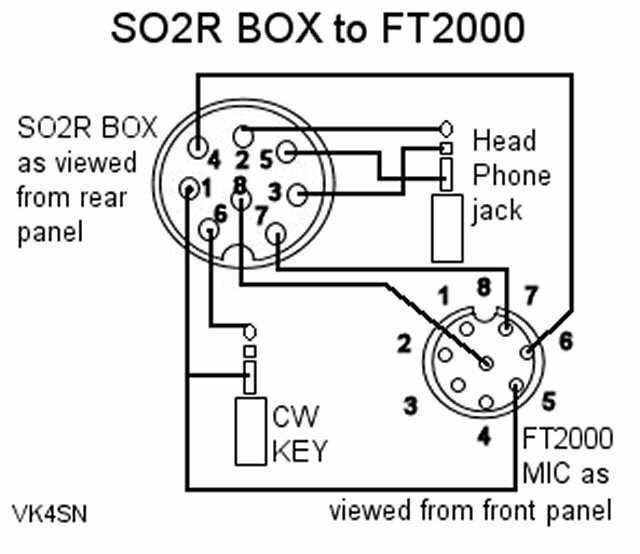 Note: Both FSK control lines require the use of a keying interface to operate FSK RTTY. The assumption is made that the SO2R Box is working correctly on CW before you attempt to set it up for RTTY. You are directed to the N1MM Logger documentation on how to install MMTTY for SO2R Operation in general. Open N1MM Logger. If you have any Digital Interfaces open, close them. Close N1MM Logger, the SO2R Box Interface or Utility, and MMTTY. Make a cable using a DB25 male connector. Pin 22 is the FSK TxD line for Radio 1, Pin 23 is the FSK TxD line for Radio 2, and Pin 9 is the return for both radios. The connectors on the other ends of the cable will depend on your radios and/or interfaces. Install the provided EXTFSK.dll into the subdirectories of both MMTTY instances in your computer. Open the SO2R Box Utility. Put a check mark where it says “Enable RTTY”. Close the SO2R Box Utility. Open N1MM Logger. Open the Digital Interface for Radio 1. On the RTTY Engine 1 waterfall display, click on “option” then “Setup” Go to the Tx Tab, and change the port to “Extfsk”. Then go to the “MISC”tab and choose ComTxD(FSK). Click OK, and a pop-up screen will ask you for the radio number, and choose Radio 1. Also, uncheck the box that says “Ask every time”. Now open the Digital Interface for Radio 2. On the RTTY Engine 2 waterfall display, click on “option” then “Setup”, go to the Tx Tab, and change the port to “EXTFSK”. Then go to the MISC tab and choose Com-TxD(FSK). Click OK, and a pop-up screen will ask you for the radio number, and choose Radio 2. Also, uncheck the box that says “Ask Every Time”. Without closing either Digital Interface, close N1MMLogger, then reopen it. If configured correctly, both Digital Interfaces should open, and no pop-up boxes should be displayed. If your FSK signal is inverted, check the setup for your radio. You may be able to invert it at your radio. If this doesn’t work, close N1MM Logger and the SO2R Box Interface, open up the SO2R Box Utility, and check “Invert Radio x” where “X” is your radio number. close the Utility and try again.